Like their civilian counterparts, engineers are the builders of the Marines. Combat engineers build and repair structures, roads and power supplies for Marine combat missions. Their duties also include using explosives for demolition and construction and operating machinery to clear minefields. These Marines also may have some non-combat duties as well, depending on the needs of the Corps at the time. A combat engineer officer oversees engineer units with Marines of varying military occupational specialties (MOS). This job, which is categorized as MOS 1302, is open to Marines between the ranks of lieutenant colonel and 2nd lieutenant. It's considered a primary MOS or PMOS, and these officers are considered unrestricted line officers. This means they're qualified to command any Marine combat units. Engineer officers command or assist in commanding engineer units consisting of Marines in various MOSs whose duties include repair, maintenance, and operation of engineer heavy equipment. This may be for operations ranging from construction, operation, and repair of structures and facilities to clearing and placing obstacles such as minefields. 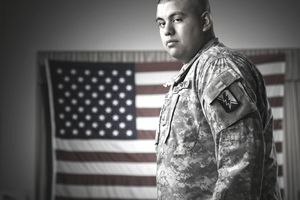 It's up to combat engineer officers to oversee and direct these activities, frequently during combat situations where troops may be under enemy fire. They're also tasked with setting up defensive perimeters for fellow ground troops. As mentioned above, Marines engineers use explosives for both construction and demolition, which includes specializes demolitions in urban environments. So combat engineer officers create and execute the plans for how, when and where these explosives are placed and detonated. Combat engineers are also responsible for storing and distributing bulk fuel, and the installation, operation and maintenance of utility systems, which combat engineer officers oversee and supervise. Even though the majority of their duties are combat-focused and the title of the job contains the word "combat," these officers and their units also support other ground troops and conduct engineering activities in non-combat situations as well. This may include overseeing humanitarian projects such as the distribution of aid, rebuilding medical clinics and schools in other countries which were destroyed by natural disaster or wartime activities. Once combat engineer officers have completed their first tour of duty, they are eligible to apply for recruiter or instructor roles. These requests are granted based on the needs of the Marine Corps at the time, however. A college degree is required for this job, preferably one in engineering or a related field such as architecture. All Marine Corps officers must be between 20 and 27 years old at the time they are commissioned and must pass a physical examination which includes a drug test. In addition, like other branches of the U.S. military, Marine officers are subject to background checks by the Department of Defense. Like all other Marine officers, combat engineer officers take specialized officer training programs. For this MOS, candidates take the combat engineer officer course at Marine Corps Engineer School at Camp Lejeune in North Carolina.